It was a shaky start for Jackson Cole as the Hun School boys’ hockey team hosted the Hill School (Pa.) last Wednesday. 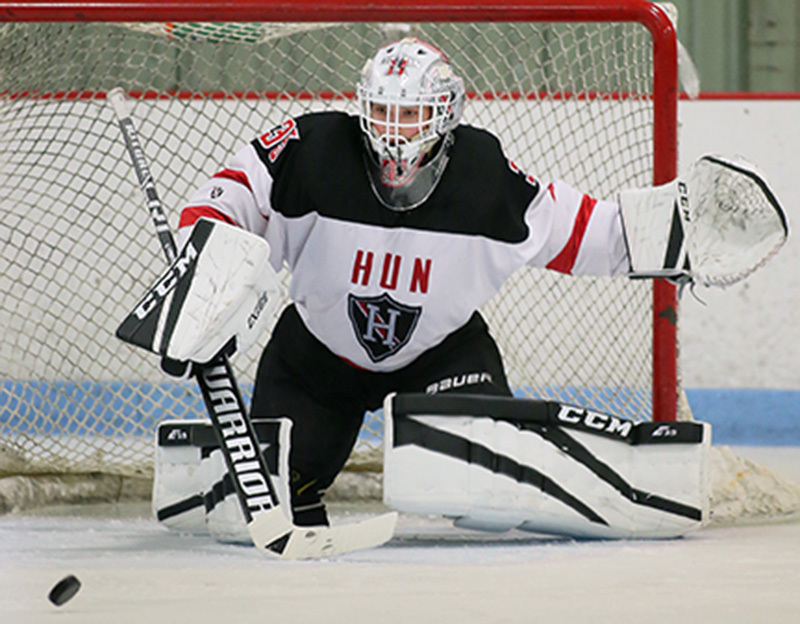 The Hun junior goalie yielded three goals in the first five minutes of the contest as the Raiders dug a 3-0 hole. “When you go down so early like that, you just think to yourself it has already gotten this bad so you might as well play as hard as you can,” said Cole. Playing hard, Cole got in a groove after withstanding the early barrage, repeatedly thwarting the high-powered Hill attack. “I started to feel like I was back on my feet after the first couple goals,” said Cole. The Raiders got some momentum in the waning moments of the first period as Eddie Evaldi scored with 27 9 seconds left to make it a 3-1 game. While Hun gave it their all over the rest of the contest, it couldn’t break through as neither team scored again and Hill held on for the 3-1 win. Cole did his best to keep the Raiders in the game, ending up 35 saves. “For goalies, once you get warmed up and you start to get into a rhythm, it is just comes easier,” said Cole. Inspired by some hard words from Hun head coach Ian McNally at the intermission after the first period, the Raiders raised their level of play. In reflecting on his progress, three-year starter Cole believes he has gotten better mentally and physically in the ice. Hun head coach McNally urged his players to get their heads back into the game after the shaky start against Hill. “We came in here after the first period and the challenge was put to them,” said McNally. Cole showed his leadership by closing the door on Hill. “Every time, any turnover, you try with one hand on your stick instead of two or you hope it gets out instead of making sure that it gets out, all of that is instantly a scoring chance against us,” said McNally. McNally is confident that his top players can compete with anybody Hun faces. “Regardless of who we are playing, we can throw five guys out there who are as good as anybody,” said McNally, referring to sophomore forward Matt Argentina, senior forward Brian Nelson, junior defenseman Hayden Watson, senior defenseman Aidan McDowell, and junior forward Evaldi. The Raiders played very well over the last two periods against Hill. “It was on them to do it, we pushed hard on 10 guys,” said McNally. McNally hopes his players can bottle that effort as Hun looks ahead to competing in the Mercer County Tournament in early February and going after its sixth straight title in that competition. “This is what were are capable of,” said McNally, whose team, now 9-7, plays at the Portledge School (N.Y.) on January 23 and at Holy Ghost Prep (Pa.) on January 25 before hosting Notre Dame on January 29. Cole, for his part, vows that Hun will take things seriously in the MCT.